Dr. Qumsiyeh was born to a Palestinian Christian family near Bethlehem. As well as being Palestinian, he has U.S. citizenship and served on the faculty of both Duke and Yale Universities where he taught and did research in genetics before returning to Palestine to do the same work at Birzeit and Bethlehem Universities. Dr. Qumsiyeh serves as chairman of the board of the Palestinian Center for Rapprochement Between People and coordinator of the Popular Committee Against the Wall and Settlements in Beit Sahour. He is author of several books, including Sharing the Land of Canaan: Human rights and the Israeli/Palestinian Struggle (2004) and Popular Resistance in Palestine: A history of Hope and Empowerment (2011) and is a prolific writer for journals and newspapers. He served on the Steering/Executive Committees of a number of groups including Peace Action, the U.S. Campaign to End the Israeli Occupation, the Palestinian American Congress, Association for One Democratic State in Israel/Palestine, AcademicsForJustice.org, and BoycottIsraeliGoods.org. He was the organizer of and the Palestine speaker for the Wheels of Justice Tour, which was sponsored by many national groups, including the Fellowship of Reconciliation. 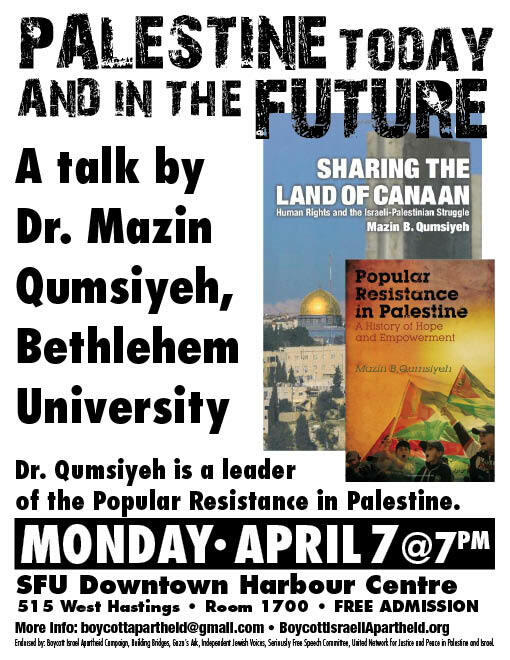 Dr. Qumsiyeh will talk to us about the current situation and share his vision of a future for all the people who live in the land of Canaan. How can Canadians help to bring about a new situation of peace and justice? Endorsed by: Boycott Israel Apartheid Campaign, Building Bridges, Gaza´s Ark, Independent Jewish Voices, Seriously Free Speech Committee, United Network for Justice and Peace in Palestine and Israel.